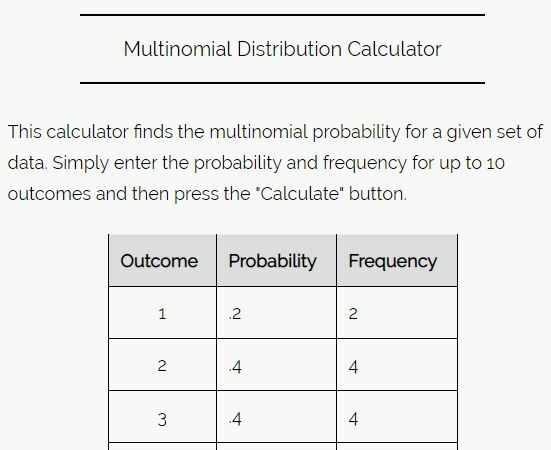 Note: A binomial experiment is a special case of a multinomial experiment in which each trial has exactly two possible outcomes. 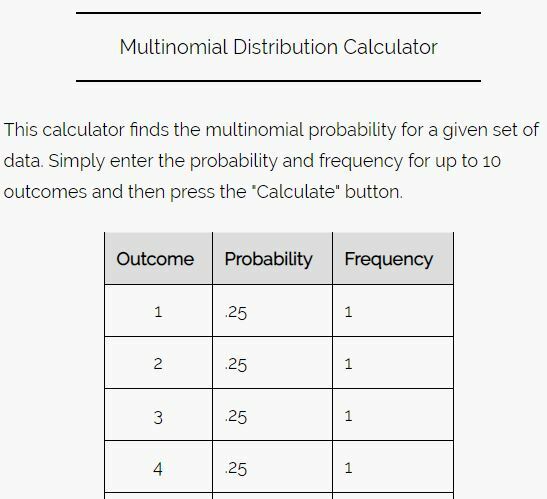 A multinomial distribution tells us the probability of getting a certain set of outcomes in a multinomial experiment. 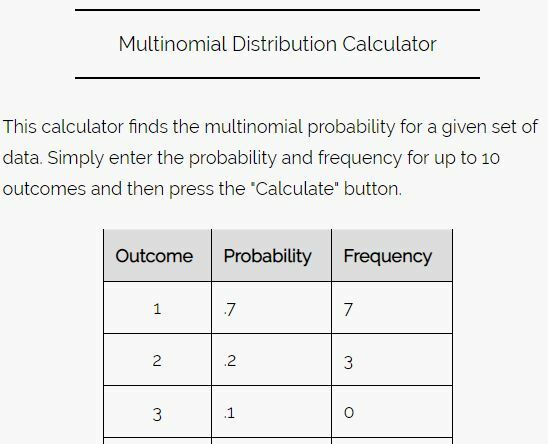 Let’s walk through some examples to gain a better understanding of the multinomial distribution. We have 10 marbles in a bag – 2 green marbles, 3 blue marbles, and 5 yellow marbles. We randomly select 3 marbles from the bag, with replacement. What is the probability of selecting exactly 1 green, 1 blue, and 1 yellow marble? Step 1: Identify the total number of trials (n), the number of times we’re interested in selecting each possible color (n1, n2, … , nk), and the probability of choosing each color on a given trial (p1, p2, … , pk). 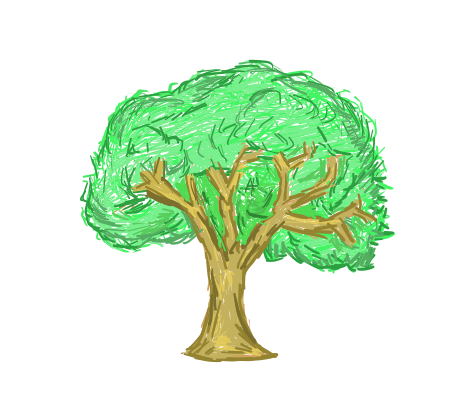 ni = we’re interested in the probability of selecting a green marble once, a blue marble once, and a yellow marble once, so n1 = 1, n2 = 1, n3 = 1.
pi = On any given trial, the probability of selecting a green marble is 2/10 = 0.2, the probability of selecting a blue marble is 3/10 = 0.3, and the probability of selecting a yellow marble is 5/10 = 0.5. Thus, p1 = 0.2, p2 = 0.3, p3 = 0.5. If we randomly select three marbles from the bag with replacement, the probability that we select exactly one green marble, one blue marble, and one yellow marble is 0.18. 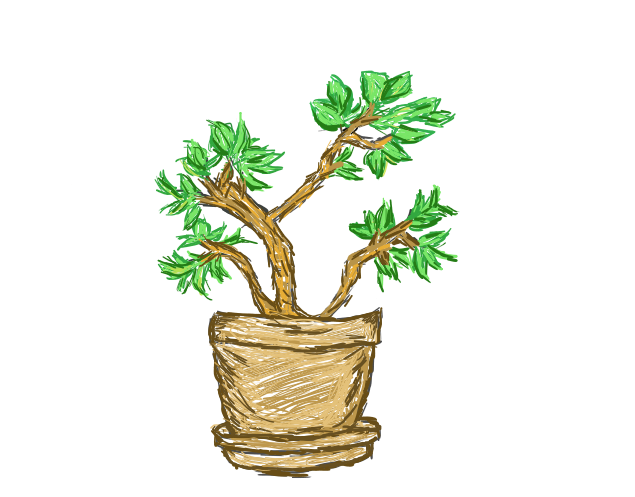 This matches the result that we got using the formula. In a certain city, 20% of voters prefer candidate A, 40% prefer candidate B, and 40% prefer candidate C. If you randomly sample 10 voters, what is the probability that 2 will prefer candidate A, 4 will prefer candidate B, and 4 will prefer candidate C? Step 1: Identify the total number of trials (n), the number of voters we’re interested in preferring each possible candidate (n1, n2, … , nk), and the probability of selecting a voter who prefers a certain candidate on a given trial (p1, p2, … , pk). ni = we’re interested in the probability of selecting 2 voters who prefer candidate A, 4 voters who prefe candidate B, and 4 voters who prefer candidate C, so n1 = 2, n2 = 4, n3 = 4.
pi = On any given trial, the probability of selecting a voter who prefers candidate A is 2/10 = 0.2, the probability of selecting a voter who prefers candidate B is 4/10 = 0.4, and the probability of selecting a voter who prefers candidate C is 4/10 = 0.4. Thus, p1 = 0.2, p2 = 0.4, p3 = 0.4. If we randomly select three voters, the probability that two of the voters prefer candidate A, four of the voters prefer candidate B, and four of the voters prefer candidate C is 0.08258. We randomly select a card from a deck of cards 4 times without replacement. What is the probability that we select one spade, one club, one heart, and one diamond? Step 1: Identify the total number of trials (n), the number of times we’re interested in selecting each possible suit (n1, n2, … , nk), and the probability of choosing each suit on a given trial (p1, p2, … , pk). ni = we’re interested in the probability of selecting each suit exactly one time, so n1 = 1, n2 = 1, n3 = 1, and , n4 = 1.
pi = On any given trial, the probability of selecting a certain suit is 13/52 = 0.25. So, p1 = 0.25, p2 = 0.25, p3 = 0.25, and p4 = 0.25. If we randomly select four cards from the deck with replacement, the probability that we select exactly one spade, one club, one heart, and one diamond is 0.09375. A certain game consists of spinning a spinner, which can land on three different outcomes: a square, a circle, and a triangle. For any given spin, the probability of landing on a square is 0.7, a circle is 0.2, and a triangle is 0.1. If you randomly spin the spinner 10 times, what is the probability that it lands on a square 7 times, a circle 3 times, and a triangle 0 times? 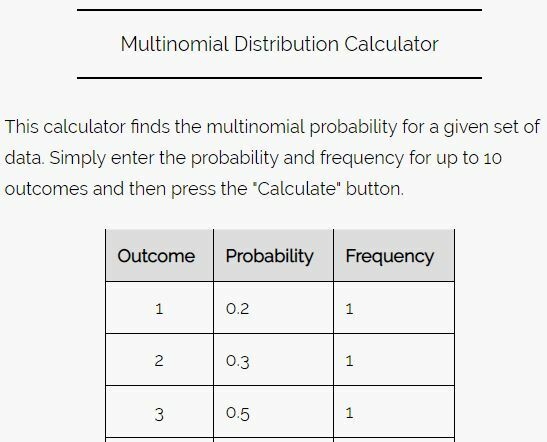 Step 1: Identify the total number of trials (n), the number of times we’re interested in landing on each possible outcome (n1, n2, … , nk), and the probability of landing on each outcome on a given trial (p1, p2, … , pk). ni = we’re interested in the probability of landing on the square 7 times, the circle 3 times, and the triangle 0 times, so n1 = 7, n2 = 3, and n3 = 0.
pi = On any given trial, the probability of landing on a square is 0.7, the probability of landing on a circle is 0.2, and the probability of landing on a triangle is 0.1. So, p1 = 0.7, p2 = 0.2, and p3 = 0.1. If we spin the spinner ten times, the probability that it lands on a square 7 times, a circle 3 times, and a triangle 0 times is 0.07906.